Chad W Smith's Home online: Super Nostalgia Bros.
People in your 30s(ish), please look at this. Please stare into your own childhood imagination. I give you - that which could never be, yet is. That, dear reader, is the impossible made real. For those who don't know what you are looking at - that is a press release image from the makers of Super Smash Bros. - a video game that will be released later this year for the Nintendo Wii U and the Nintendo 3DS/2DS. 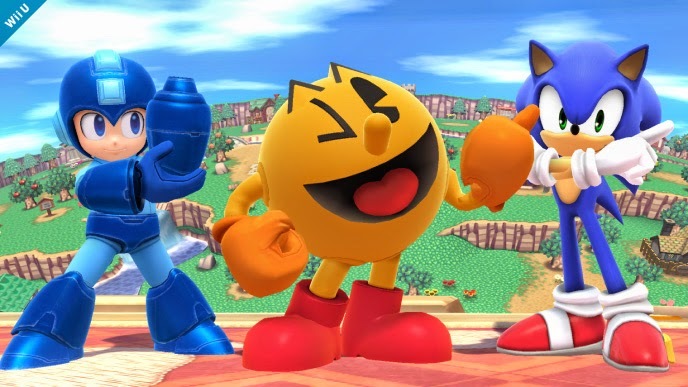 In it, we see four characters, (from left to right): Sonic the Hedgehog, Mega Man, Pac-Man, and Super Mario. Those four characters are owned by four different companies: Sonic = Sega, Mega Man = Capcom, Pac-Man = Namco, and Mario = Nintendo. Sega and Nintendo were rival companies who both produced video game consoles. 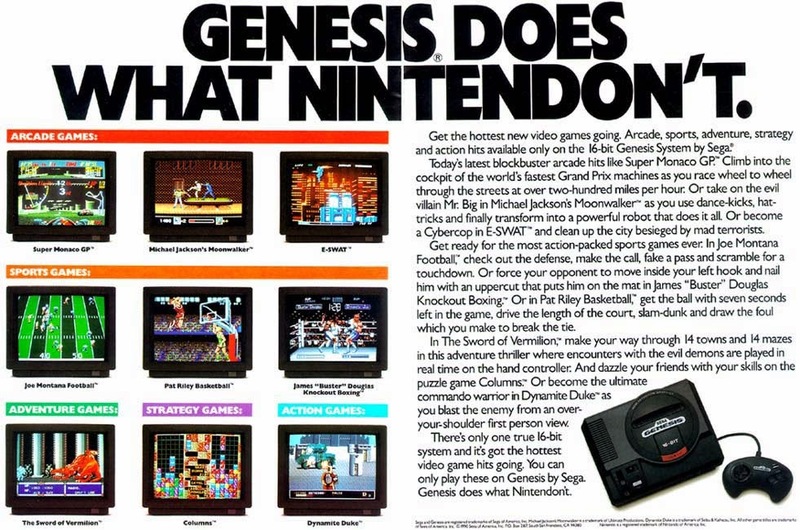 They were like the Microsoft and Sony (Xbox / Playstation) of today - only the rivalry wasn't just confined to boardrooms, fanboys, and the occasional soft-jab at tech conferences... "Sony's optional camera..." it was straight-up, in-your-face, called-out-by-name marketing campaigns.... Namely "[Sega] Genesis does what Nintendon't." 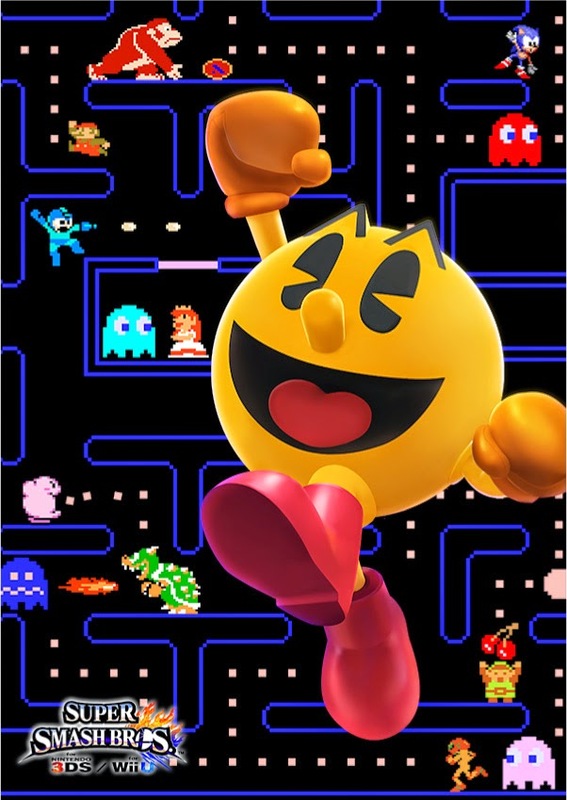 Namco and Capcom never made consoles - that I am aware of anyway, excluding tabletop arcade cabinets and plug-in-play controller type things - but both made, and make, video games. The Manly Men Pac and Mega might not have ever been rivals in the same vein as Mario and Sonic - but it is still nearly unthinkable to the 1980s / 90s childhood mind that you would ever see them in the same game. Imagine an Angry Bird in Farmville, or Vault Boy giving advice to Nathan Drake, or Cortana and Kratos playing cards... It's just madness. But really, this is part of trend. Before I expound on that, I want to take a step back. No matter what your age, think back to your childhood. Walk into your 8 year-old self's bedroom and get out your toys. Like at least 10 different toys. Now start playing with them. The point is - when you play with toys, the vast majority of kids don't keep different "worlds" separate. Star Wars and Star Trek and Lord of the Rings and Chronicles of Narnia and Muppet Babies.... They were all the same thing. They were all toys. And in our imaginations, there were no barriers, no reasons to keep them apart. We didn't care about which toy company made the toys, which stores sold them, which content creator owned the intellectual property.... If we wanted our Super Mario figure to race our Sonic plushie... then - by gum - they freaking raced! Now, we who were children in the 80s or 90s or 70s.... we're all adults now. To some extent, according to our driver's license anyway. Our generation is in a place to make decisions regarding what entertainment we produce for ourselves, and for the generations after us. And we want them to play with all the toys. Not just the ones from this "walled garden" or another. I mentioned this was a trend. 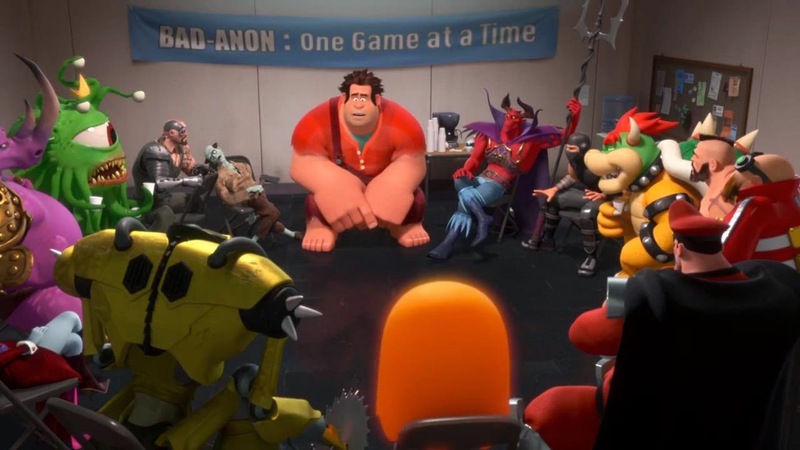 Wreck-it-Ralph is a good illustration. In fact, it pretty well foreshadowed this game. Other movies - like the Toy Story franchise, for example - do similar things. Like putting Barbie and Mr. Potato Head and a Speak-and-Spell in the same universe, one character just as real and alive and relevant as the next. Actually, fighting games have long been the one place that fictional universes collide on a regular basis. Virtually any time a fighting game has the word "Versus" in the title - it's smashing (puns!) two or more worlds together. Capcom did a lot of this (SNK, Namco actually, Mavel, just to name a few). Street Fighter, Mortal Kombat, Tekken... they've all had multiple "Versus" fighting games against each other, or other fictional universes. And even if a fighting game isn't a versus style game, they will often include cross-over characters. Yoda, Darth Vader, Freddy Krueger, Kratos.... they've all made fighting game cameos over the years. In fact, the entire Smash Bros. series of games is based on this concept of cross-overs. Mario and Link and Samus... they may all be owned by Nintendo, but they are still different franchises. (Even if the argument can be made that they exist in the same "universe".) It was very much a cross-over game. To bring it all home, the ending of the very first Super Smash Bros. on the Nintendo 64 (SPOILERS for a 15 year old game!) revealed that the entire "game" took place in a child's bedroom. (Edit: It's actually "revealed" in the intro as well.) The characters were merely toys and the kid was just making them fight for fun. The Boss character of "Master Hand" was the kid's own hand fighting the toys directly. In the end - fictional characters are toys - and being able to play with them the way we want - regardless of copyrights, trademarks, and patents - is what makes the characters truly "ours". And I am very happy to see that reality being reflected in this game. 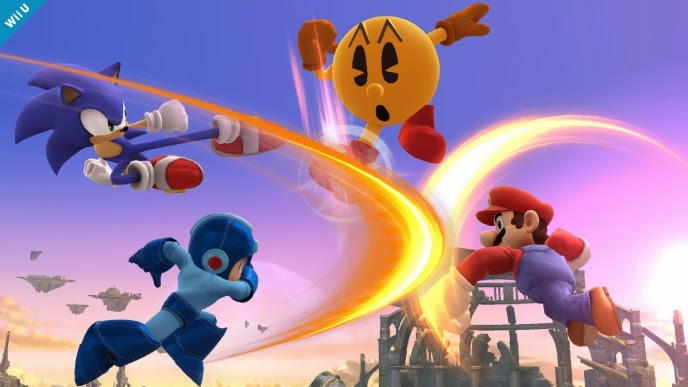 How cool is it - Pac-Man, Mario, Mega Man, and Sonic... side by side - in a real legit game. Not some fan-fiction, homebrew mashup, but a real Nintendo-Seal-of-Quality game. Keep dreaming, kids. Crazy things happen everyday.